Ferri's Pizza is a pizza place that I've heard of many times from the NEPA Nation, but just hadn't gotten down to Moscow to give it a try. I first learned about Ferri's from the wildly popular potato pizza that they serve every year during lent that was brilliantly reported on by renowned artist and foodie Hawk Krall. Also, when I crowdsourced a list of the best Old Forge Pizzas in NEPA on my social media accounts Ferri's was among the more popular suggestions. 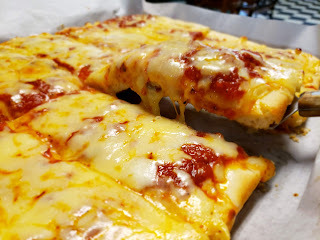 As I prepared to submit my personal Top 10 Old Forge Pizzas in NEPA to PMQ magazine I knew I had to try Ferri's and make a judgment to have any credibility and I'm glad I did. For some reason, I always think of Moscow as being on the other side of the world but after popping the restaurant into google maps while I was in the Scranton area, I noticed it was only 17 minutes away! This was a pleasant surprise as I was going to call in my order once I got in the car, but there was no reason to do so to save 17 minutes. I figured I'd just head down and dine in to get the full experience. Upon entry, I thought I might have been in the wrong place - or fell into a coal mine! The entryway isn't just decorated like a coal mine - it IS a coal mine complete with a replica coal miner, tools, and coal everywhere! I proceeded further and found that the restaurant also doubles as a coal mining museum with artifacts and photographs throughout the dining area. There were even souvenirs for sale to complete the museum experience! See the video review here! I very much enjoyed the historical journey through the coal mine, but I was there for the pizza. I placed my order for a 12 cut tray of red Old Forge pizza for $14.50. A quick shout out to the wonderful staff who helped me figure out the ATM and took great care of us during our visit. Just a note that Ferri's is cash only so be sure to plan ahead! The pizza was ready in the blink of an eye and at my table before I was done taking in all of the coal mining artifacts surrounding my table. I'm always happy when the crust comes out fully cooked without the cheese being burned on top and this was cooked just the way I like it. 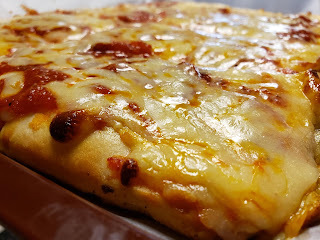 The yellow cheese blend was melted neatly on top of the dark and chunky sauce which combined with the golden brown crust gave a lovely color palate to observe. 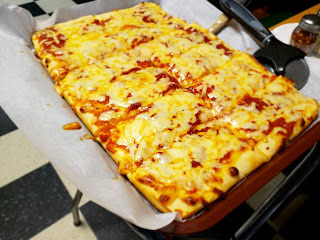 After the first bite, the cheese, which I thought to be American or something similar, stuck immediately to the roof of my mouth and teeth which is customary in the Old Forge pizza world. The sauce was the focal point of this pizza as it was quite hearty with plenty of chunks. It was packed with flavor and although I didn't find any noticeable chunks of onions there were certainly onions present. The crust was crisp around the edges and softer in the center. It was fairly light and had a nice tenderness to it. 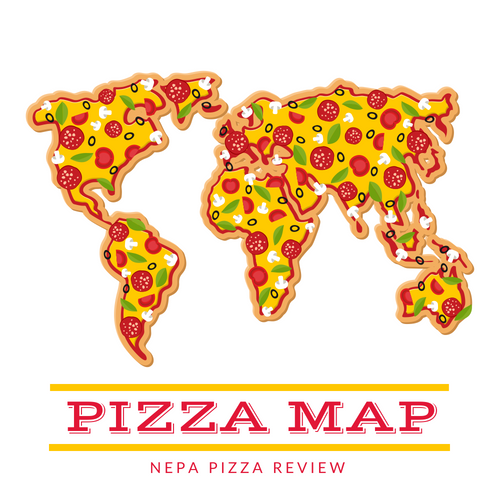 Overall, I very much enjoyed this pizza and I'm so glad that I took the advice of the NEPA Nation and made the shorter than anticipated voyage to Moscow. After carefully ranking every Old Forge Pizza that I've tried in my lifetime, Ferri's made my personal Top 10 list on PMQ. 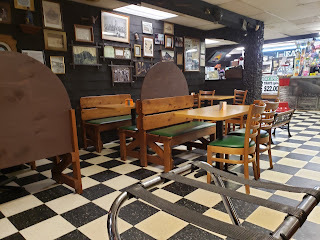 I wondered how a pizzeria in Moscow could make such delicious and authentic Old Forge pizza, until I researched their history to find that the business was actually founded in Old Forge way back in 1936 during the coal mining boom. What a fascinating and historical pizzeria! If you love Old Forge Pizza and/or coal mining history, you will love Ferri's Pizza! Ever since I was a kid I've eaten in one Ferris pizza or another. From any of the Ferris pizza boys. All OF Billy Ferris uncles! They all a pizza place of sorts. From Monte Ferri , to Tommy Ferri, to his dad Vince Ferri. It's in your blood! Old recipes that stood the test of time since 1936! Altho they're not around the corner from me I soo look forward to picking up a tray. I'd suggest you put it in the trunk or outta reach. I finished 8 pieces before I even got home. Lol That smell!!! Voted. Ferris the best. Excellent food. I Having been going there for years staff is always friendly and super nice. Wish I lived closer.